The Canada vs. USA game should be very tight. 1. They have a goaltender who is capable of standing on his head and stealing games. We saw this versus Canada in the preliminary game. 42 saves is no easy task. 2. More rest and practice time. They had a bye into the quarterfinals while Canada had to play Germany. Also the game versus Finland was more of an in-game simulator in the semis since they were in front 6-0 after the first period and had the game in the bag. 3. Youth and quickness. The Americans have a young team that will be energized and can really test the defense with their quickness and agility. 1. They aren't a very experienced team internationally. The old guard of Gomez, Gionta, Modano, and the like were left home this year in favour of the young guns. We'll see how they handle the pressure of such a big game and if they can keep their emotions under wraps and not take dumb penalties and make careless errors. 2. Lack of adversity all tournament. Other than Canada they have cruised through all their games with no problems. The Swiss game was pretty close but at no point did it seem like they would lose. Sometimes adversity can go a long way in helping teams learn where they need to improve. Where Canada has the advantage. 1. Home rink advantage. Although the US will be the home team because of their record, the Canadians will have thousands of screaming fans and all Olympics we've seen how the fans have helped give Canadian athletes a boost. 2. Leadership and experience. Crosby won the Cup last year, Scott Niedermayer has won pretty everything you can win, and there are nine players on this team that are Captains with their clubs. So they know how to prepare and perform when everything is on the line. 3. Mobile and punishing defense. Canada has big boys like Pronger who can dish out big hits, players like Boyle and Niedermayer who can go into power forward mode, and a group of mobile defense with hard shots and punishing hits. Other than the preliminary game, the US has not had to face a defense of this calibre. 1. Energy? Canada has had to play an extra game and has had a much tougher path to the final having to dispose of Russia in the quarterfinals and then Slovakia in the semis. In such a short tournament that is alot of hockey and some tough games. 2. Can Luongo come up big in the big game? We've seen big collapses by Luongo in the past in game 7s. Up until a few years ago he had played most of his career never making it to the playoffs. Also so far this tournament Canada hasn't had to rely on their goalies to steal games, although Luongo did come up huge in the last 5 minutes of the semi-final versus Slovakia. Welcome to my third annual installment of “10 Reasons why you should cheer for (insert team name here)”, although I’m not sure why I haven’t just renamed it to “10 Reasons why you should cheer for the NFC team and not the AFC team”. The purpose of this article is to help people sitting on the fence to fall of the fence on one side or the other. It is a serious article and I truly hope it does not entertain you. 10. Lets be superficial here, gold and black not only is more intimidating than blue and white, it also looks better. When people have the blues they are said. When they have gold they are happy. Simple colour theory. 9. Where the heck is Indianapolis and what is so exciting about it? Sure they have the Pacers and their 0.347 winning percentage and a big raceway, but other than that? Snore. Meanwhile New Orleans is the home of the Mardi Gras spectacle and is the birthplace of jazz. A Superbowl party in New Orleans would be much more exciting than one in Indiana. 8. The Colts won Super Box XLI in 2007. I’m not sure about you, but I would rather watch a new episode of LOST than watch a re-run. Also how can you not cheer for the team that has never won it before? 7. Drew Brees. He is the man. While Ray Lewis is in a league of his own when it come to pumping up the team before a game, Drew comes pretty close (see video at end of post). Not only does he pump up his team, but he has also pumped a city and helped a city get back to normal after the devastation of Hurricane Katrina. 6. Jeremy Shockey will hunt you down if you don’t cheer for the Saints. 5. Archie Manning (Colts QB Peyton’s dad) was a QB for the Saints for ten years. He still lives there and has close connections to the city. Both of his sons have Superbowl rings and have had their chance, so even if his son’s team loses, it is a win-win situation for him as the team that he is closely associated with would be champions. 4. When is the last time a horse has done anything for you? The car has made the horse and buggy irrelevant. When is the last time a saint has done anything for you? Well Jolly Ol’ Saint Nicholas fills your shoes with candy every year. 3. The key to success is a healthy and balanced diet. Now while Peyton Manning may be the best chocolate in the superbowl box, you can not survive on just chocolate alone. You need your brocolli, baby carrots, bread, milk, and sunshine. With Brees, Colston, Meachem, Henderson, Shockey, Thomas, Bell, and Bush, you have just that. 2. The Saints bandwagon has shinier rims and shock absorbers. 1. And the final reason, the one that I use year after year. The one that is meant to pull on your heart strings if all those strings have not yet been pulled: Cheer for the underdog. Sure these are two very good teams led by two of the best QBs in the game. But just take a peak at NFL.com and the overwhelming majority of experts peg the Colts to win the Superbowl. Reality TV and drama are not made up of the favourites ruling all, they are made up of the underdog coming from behind to melt your heart and put a smile on all. 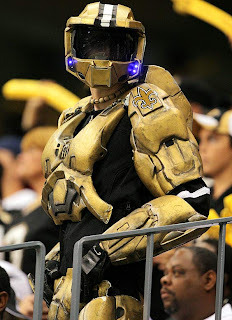 So get out your black and gold and cheer on Whodat Nation. Hello fridge buzzers. I have started a new blog that focuses on music. 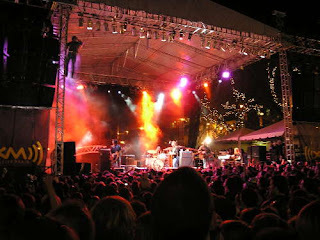 Lately this blog has turned into a place where I've just been putting up concert reviews, album countdowns, and the like. So from now on most of my music content will be on the new blog and I'll set this aside for non-music stuff. By the start of Sr. High, I had purchased a bunch more U2 records as well as their Live from Boston DVD. In grade 11 I went on a trip to Boston and saw them perform on the Vertigo Tour. 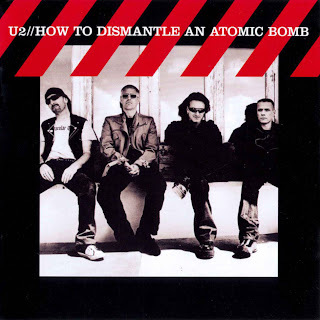 Their album How To Dismantle An Atomic Bomb was released on my mom's birthday in November 2005. I never had been, and never have been so excited for an album as this one. I listened to the daylights out of this album. I was completely obsessed with U2 listening to their entire discography at any given moment. Another significant moment in Highschool came in early July of 2004 when I was the sickest that I've ever been. During this time CBC showed Coldplay's show from Sydney Australia which is on the Coldplay Live 2003 DVD. Usually when you are sick you play lots of videogames and watch lots of TV. I did neither. I just watched/listened to the recording that I made of this onto VHS and craved Subway which unfortunately I could not stomach. 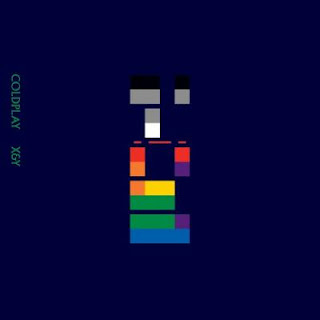 This started off a big love of Coldplay and had them firmly entrenched as my favourite band after U2. The release of X&Y was a special day as a bunch of us skipped class to walk to Future Shop and pick up the album and then all walked into Physics with Mr. D (we were all late) and listened to the album in our discmans and gave the thumbs up to each other as we heard songs like White Shadow for the first time. My friend Alex also introduced me too a bunch of bands such as the Red Hot Chili Peppers, the Trews, and Pink Floyd. All of which I grew to really like. All these influences caused me to love other British bands such as Keane,Oasis, and the Killers who are from Las Vegas but sounded like they were a British band on their debut album Hot Fuss. A fond memory I have of that album is walking down a beach with Colin in Cape Breton blasting Everything Will Be Alright and buying way too many slushes. The Junos were held in Halifax in March of 2003 when I was finishing up Grade 11. Coldplay were playing one song, but I wasn't willing to dish out the big bucks to see them play one song and have to suffer through Nickelback and the Black Eyed Peas. Luckily there were other exciting and free music events including a show with Joel Plaskett Emergency, Matt Mays, the Trews, Jimmy Rankin, and Garrett Mason. All of these Nova Scotian artists were my among my favourites, and still are some of my favourite musicians. The show was downtown and I had never been in such a large area filled with so many people standing for 5 plus hours. There was no room to move anywhere and my ears rang for a day straight after, but it was all worth it. The last couple weeks of highschool while I was studying and preparing for graduation/prom and all that fun stuff I started listening to The Eraser by Thom Yorke. An album that would radically alter my listening tastes during my university years. Being born in the middle of 1988 set me up perfectly for this sort of a Decade in Music sort of review. In the 80s I am not quite sure what sort of music tickled my fancy. I think at that point I was subconsciously being fed Bruce Cockburn since I know a large number of his songs but have no memory of ever listening to them until a few years ago. In the 90s I wasn't really that interested in music either. At this point I was mostly listening to the folk music of the Rankin Family (Cape Breton), Rawlings Cross (Newfoundland), and the Irish Descendants (Newfoundland). 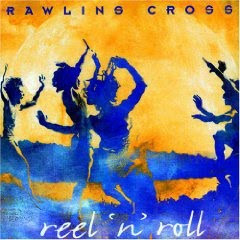 In particular Rawlings Cross version of McPherson's Lament is what made me want to learn the bagpipes, which I did play for a short time. And yes, I had that song mastered on the pipes. Jr. High is when I first started listening to music. I would hook up this old discman to crappy computer speakers in my room while I played with Lego. It usually consisted of Christian rock, so bands like dc talk, Newsboys, and Delerious. I was also listening to quite a bit of Blue Rodeo. The random button was my best friend. 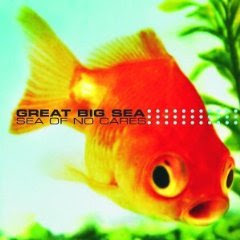 But the first band that I really became obsessed over was Newfoundlands folk rockers Great Big Sea. In November of 2002 I went to my first "big" concert at the Metro Centre where they played along with Crush. Me and my friend Chris listened to them all of the time and also had our own hilarious versions of their songs. I was also listening to some Our Lady Peace at this point. Looking back I had a very limited range of music. Mostly Christian with a few other Canadian bands thrown in. Perhaps the biggest moment of this time period came in February of 2002. 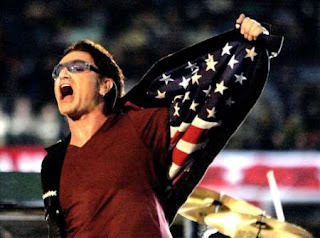 The Superbowl halftime show featured Irish band U2. The site of Bono singing MLK and words from the Psalms with the names of victims of 9/11 scrolling was a very powerful moment. The climax of Where The Streets Have No Name when the names collapsed will forever be embedded in my mind. The power, emotion, and big sound that came from this guy in sunglasses started off the U2 journey for me. I had a burnt copy of All That You Can't Leave Behind as well as the Best of 1980s greatest hits album. 10. Old Crow Black Night Stand Still - Hey Rosetta! For this section of my year in review I will be posting my top 50 songs of 2009. While I won't be writing about each track, I will include youtube links to the top bunch as well as a couple 8tracks links so you can listen to selected songs. 48. Laura Palmer’s Prom - You Say Party! We Say Die! 3. Yeah Yeah Yeahs - Its Blitz! Earlier this year, Jonny Greenwood of Radiohead declared that Grizzly Bear is his favourite band. Call it the Oprah effect, but now everybody wants in on the Grizzly Bear action. Jay-Z was spotted at one of their shows this summer, and even Michale McDonald of the Doobie Brothers lent his vocals for a b-side version of While You Wait For The Others. Basically Grizzly Bear, the indie darlings, made it huge this year. The first single Two Weeks had a power of its own, the opening piano notes, the catchy chorus, the harmonizing vocals. After being stuck in the heads of indie hipsters and not so indie hipsters for weeks the album finally dropped. But don't drop it too hard, since each and every note in the song is carefully crafted. The timing of each wave of percussion, each set of harmonizing vocals, every pluck on the bass. While it is apparent great care was taken in the recording of the album, this in no way detracts from the grandness of the whole thing. While You Wait For The Others is proof of this, one of the best overall songs of the year. 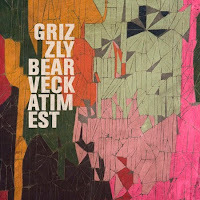 While the album may not click on the first listen, a few listens in show why this album has spurred on a new group of Grizzly Bear fans. Some albums take a few listens to make their impact. But not Fantasies. Metric bring their A-game to the table delivering over forty straight minutes of pop with meaning, rock with soul, and the sounds of finely crafted songs. The album opens up with the first single Help I'm Alive, almost a cry to show that this album is alive, that there is something behind the drums, bass, guitars, and vocals. Don't blink, as soon as its over it is straight into Sick Muse continuing the themes of love, real love, mirages of love, and finally stadium love. 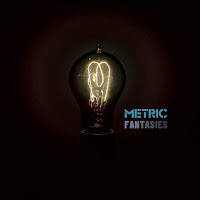 Metric is at their finest here, with a healthy mix of guitar and synth sounds. Emily is in peak form delivering some of her best lyrics of her career, including the unforgettable question of "Who would you rather be: the Beatles or the Rolling Stones" in Gimme Sympathy.